(Bloomberg) -- The U.K.’s new Brexit Secretary likes to fight. Dominic Raab, 44, is an amateur boxing champion who holds a black belt in karate. In one of his previous roles, he served as a key adviser to David Davis, the man he’s replacing. Davis is also famously pugnacious, and was a reservist for Britain’s SAS special forces. Although ambitious, Raab initially struggled to get promoted under former Prime Minister David Cameron, and opted to make trouble instead, fighting to stop people in prison from getting the vote, and for tougher sanctions for Russian officials accused of human rights abuses. On Brexit, this is his history: Before he became a member of Parliament he worked both for David Davis, one of the original “Brexiteers” and for arch-Remainer Dominic Grieve. 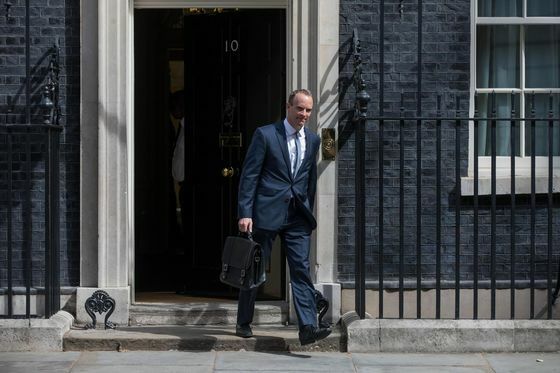 Raab is firmly in the Brexit camp and campaigned alongside former Foreign Secretary Boris Johnson and Environment Secretary Michael Gove to leave the EU in the 2016 referendum. It’s likely that May chose Raab at least in part because of his credentials as a true believer in the Brexit cause. She voted to remain in the EU two years ago and still can’t say whether she would support Brexit if a new referendum were called today. Yet she knows she needs the support of Brexit backers like Raab to give her strategy political credibility. Despite his euroskeptic outlook, Raab acknowledges that many voters in his constituency southwest of London felt strongly the other way. Since the 2016 referendum he has adopted a policy of meeting one anti-Brexit constituent a week to hear them out.